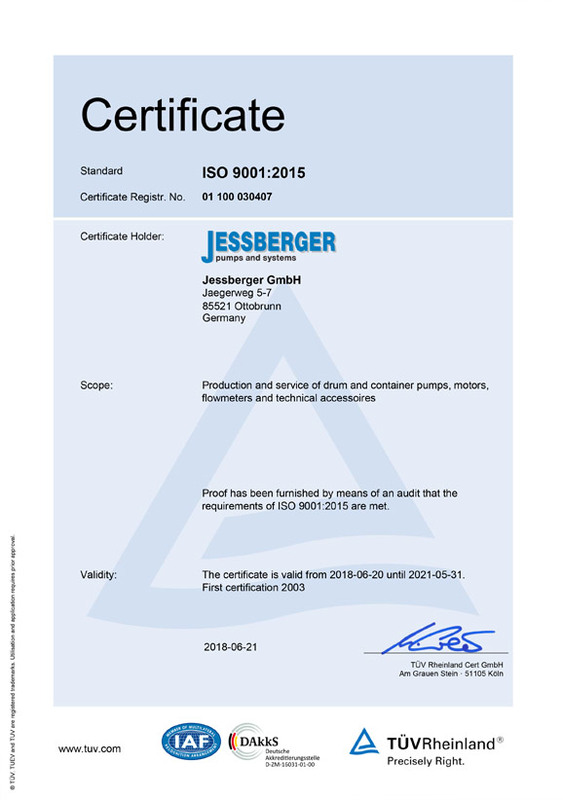 On 24 and 25.05.2018 our company was confirmed in an annual control audit by TÜV Rheinland that the Quality Management System of JESSBERGER corresponds to the requirements of ISO 9001:2015. 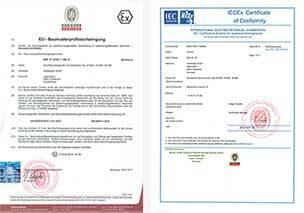 In addition, it was verified by the audit that the conditions came into force since 04.20.2016 of the new ATEX Directive 2014/34/EU are fully complied. We were therefore again officially confirmed that our company’s high standards for the manufacture and sale of pumps – also in ex-protected design – are met. And this since the beginning of our production in the year of 2003. Based on the annual verification audits our company’s internal procedures and processes, products and services are continually evaluated and improved. Always with the aim to deliver high quality and safe pumps at an optimum price / performance ratio for our customers and resellers. 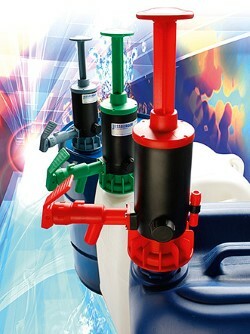 The quality of our products and the satisfaction of our customers is of extremely great importance at JESSBERGER. Therefore our quality management system has been certified according to DIN EN ISO 9001 many years ago. The TÜV CERT certification authority of TÜV Anlagentechnik GmbH (Group TÜV Rheinland Berlin Brandenburg) has informed us on 14/05/2003 in accordance with TÜV CERT procedures that our company has introduced and applies a quality management system for the production and distribution of drum and container pumps, motors, flow meters and technical accessories. 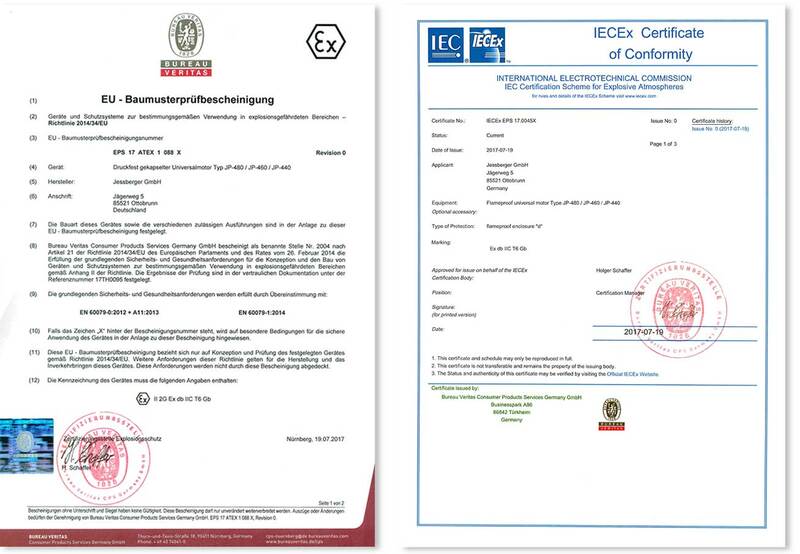 At the same time we have been certified by the TÜV CERT certification authority responsible for explosion protection according to directive ATEX 2014/34/EU at TÜV Rheinland GmbH, notified body of the European Community with identification no. 0035, in accordance with TÜV CERT procedures that our company has introduced a scope of product inspection and testing of pumps and motors and applies a quality management system. An audit, report No. 030 407, adduced evidence that the requirements of directive 2014/34/EU on explosion protection, annex IV are fulfilled. Therefore it has been attested by an official authority that our company complies the high standards for the manufacture and sale of pumps – also in an ex protection design. Because of the annually proceeding reviews our internal procedures and processes, products and services are continuously monitored and improved. Always with the aim to deliver high quality and safe pumps at an optimal price / performance ratio to our customers and resellers. The motors in 400, 600 and 800 watts are approved according to the latest standards (ATEX directive 2014/34/EC as well as IECEx) and offer in combination with a stainless steel pump tube the highest safety when pumping flammable media or use in hazardous environments. These new explosion-proof motors will be a further milestone in JESSBERGER’s history and secure the company’s growth in the coming years. I thank our technical management, the engineers and technicians for their efforts and am very pleased with these motors, which will open up many new markets. I would like to thank our technical management, the engineers and technicians for their commitment and we are very pleased with these motors, which will open up numerous new sales markets.